The Rechargeable Batteries Hand Crank LED Solar Flashlight is an emergency flashlight with built-in rechargeable battery. Made with classic design, its a durable torchlight for use as an outdoor survival gear. 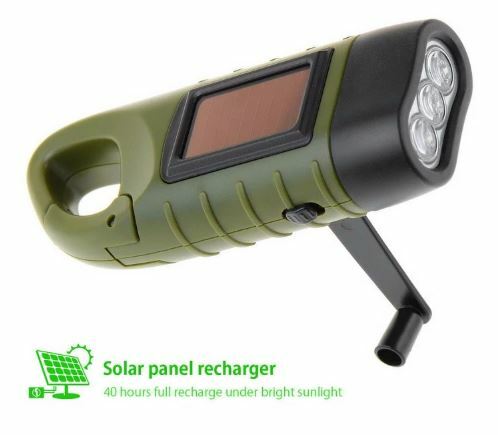 Get Your Rechargeable Batteries Hand Crank LED Solar Flashlight Here. Order it today! 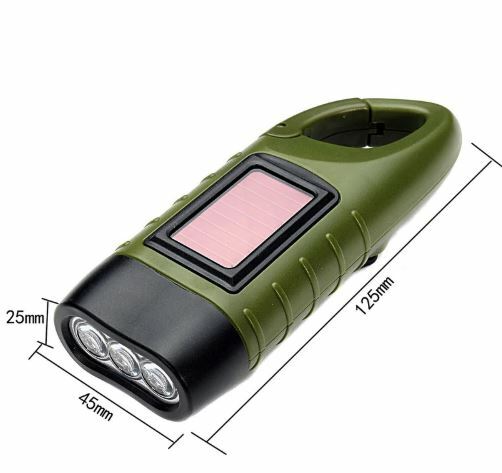 This High-quality Portable Camping Light is just what you need for your excursions in the wild. Equipped with user-friendly carabiner flip, just clip the flashlight in your backpack, then take it along for camping, hiking, climbing, and other outdoor adventures. With built-in rechargeable powerful battery, you can store energy and use it in another time. There’s no external battery needed, so there’s no need to buy if it runs out. To charge, just place the torchlight under the sunlight or even under any artificial light. It will gather and store hours of solar energy. So, what if the battery drains in the dark and no sun or light to charge, then just turn and crank the handle to recover some power even in deep night darkness. The flashlight supports two charging methods: Hand cranking and Solar powered. So, you have portable that light will never run out of power. It has a high conversion efficient usage of Kinetic energy. Just 1 minute of cranking by hand can generate 10 minutes of light (based on one speed on two rounds per second). Repeated cranking helps restore the rechargeable NiMH batteries to its charged state. There’s no more need for plug-in charging since it gets powered up, in an eco-friendly way. You save from batteries and electricity. You can use it as an excellent survival tool, in case of unexpected power outages and times where electricity might be stored for a longer period. 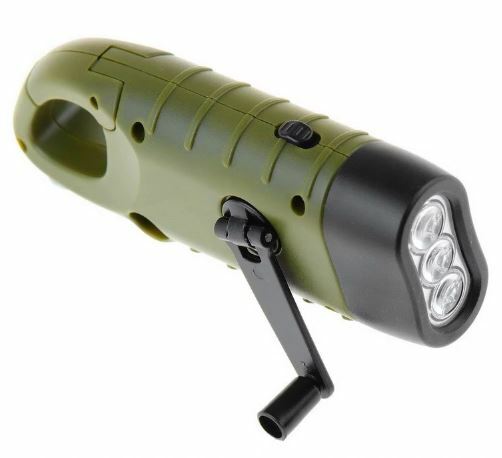 The Emergency Army Green Hand Crank Torch has a solar panel that you can use as a backup power. It can absorb all kinds of light, from strong and medium sunbeams, even from lamp light and others. securely to attach to your backpack, while lightweight enough that you can add for the minimum load on the road. It’s rainproof, weather, and water resistant, but don’t keep the hand crank flashlight underwater for long hours for no reason. 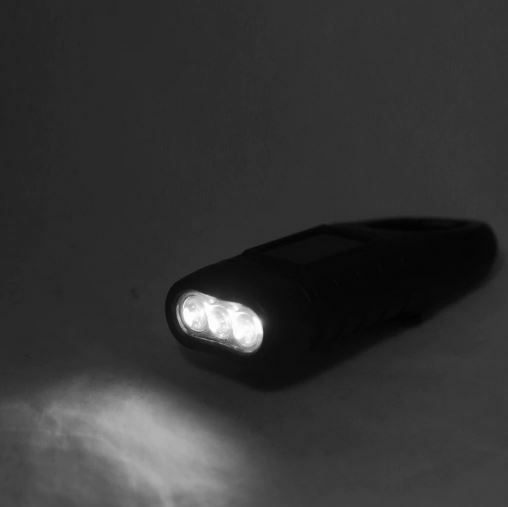 The flashlight works as its expected and would be able to tolerate any bad weather. 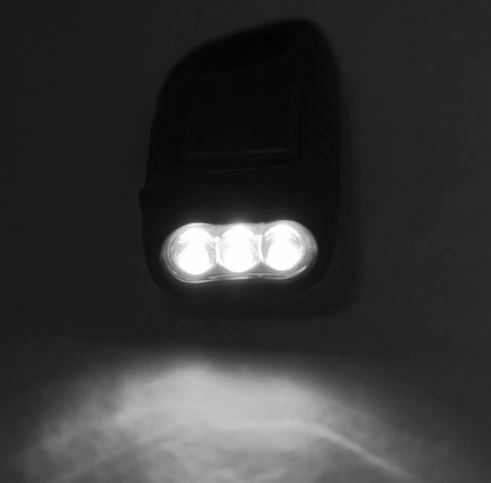 It’s a great emergency back-up light as if your changing tires in the evening and there’s rain or snow. The flashlight is a good device for its intended purpose, such as your main lamp run out power or bigger flashlight powers down and you can’t get batteries, but you need light and power to work asap. 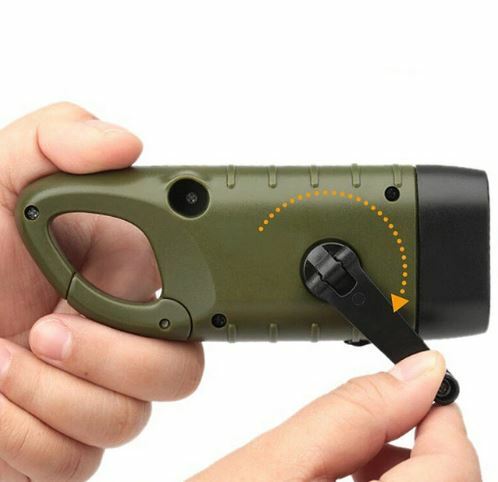 Simple, functional hand crank flashlight for your emergency needs. Order Your Rechargeable Batteries Hand Crank LED Solar Flashlight Here. Get it here!